(MP047). W L Wyllie (1851-1931). Etching, signed.. 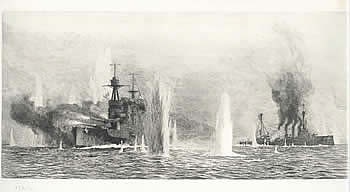 This etching  exhibited at the Royal Academy in 1917 - shows the crippled HMS WARRIOR (Captain V B Molento RN) of the 1st Cruiser Squadron limping out of action with the German High Seas Fleet’s battle cruisers; and HMS WARSPITE (Captain E M Phillpotts RN) under starboard helm as, with her steering gear jammed, she too came under heavy and sustained fire. The brave WARRIOR was later taken in tow by the seaplane carrier ENGADINE (Lieutenant Commander C G Robinson RN) but during the following day, with worsening weather, it was decided to transfer WARRIOR’s ship’s company to the carrier. The abandoned cruiser later sank that night. WARSPITE lived on to fight another day and another war and was eventually scrapped in 1947. This etching, the property of the Wardroom Mess HMS SULTAN, features in More Sea Fights of the Great War’ published in 1919 by Cassell and Company Ltd of London, New York, Toronto and Melbourne and illustrated by WL Wyllie and Irwin Bevan.